Select the cells in which you want to add or change the fill color. On the Table Design tab, click the arrow next to Shading. 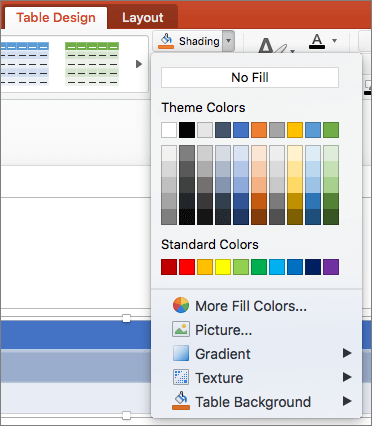 Click the color you want from Theme Colors or Standard Colors, or click More Fill Colors. Select the cells in which you want to apply a fill effect as the fill color. Click Gradient to select and apply a gradient effect. Click Texture to select and apply a texture effect. Select the cells in which you want to remove the fill color. On the Shading menu, click No Fill. On the Tables tab, under Table Styles, click the arrow next to Fill. On the Fill menu, click the color you want. On the Fill menu, click Fill Effects. Click the Solid tab, and then click the color that you want. Click the Gradient tab, and then click the options that you want. Click the Picture or Texture tab, and then click the texture that you want. On the Fill menu, click No Fill.